Jazz Standards with Strings (2 CD Set) for any Bb or Eb instruments (trumpet, clarinet, alto sax or tenor sax). Jazz and Play Along. Sheet music and accompaniment CD. 61 pages. Published by Music Minus One (MO.MMOCD3219).ISBN 159615246X. Jazz and Play Along. 9x12 inches.This 2-CD set of superb jazz standards brings you soloist Larry Linkin with string accompaniments; then he steps aside and lets you work your own artistry. 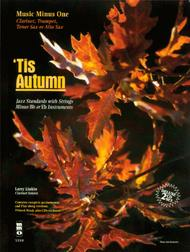 Enjoy such classics as Night and Day, 'Tis Autumn, In a Sentimental Mood, and many others! Soloist: Larry Linkin, clarinet.Includes a complete, high-quality printed music score with performance suggestions; and two compact discs containing the complete version of each piece with soloist and accompaniment; then a second performance with accompaniments minus you, the soloist.